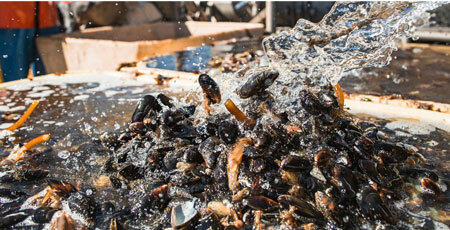 Did you know that our mussels are packed straight after they come out of the sea, before they leave the Islands? Note that the date used on the health mark is the packing date – not the harvesting date – so you can’t always be sure that the mussels you buy were harvested on the same day. For us, the harvest date is the most important as far as shelf life is concerned, and that is why we make sure that our mussels are harvested and packed on the very same day.